Concept: This relatively uncommon deciduous forest is found on floodplains and river terraces across mainland Nova Scotia. The Black cherry - Red maple / Rough goldenrod - Jack-in-the-pulpit Vegetation Type (VT) is an early to mid-successional forest characterized by prominent black cherry and by a moderately broad group of floodplain and upland understory species. This is a relatively temperate forest. Vegetation:Canopy layers are well developed in most FP5 sites, but younger or poorly-developed stands have lower, more widely-spaced, trees. Black cherry is prominent but may co-dominate with red maple or, less often, with white spruce. Other tree species are less common and may be restricted to the understory. The shrub layer is very well developed with the highest mean cover of any flooded forest in Nova Scotia. Black cherry, choke cherry and beaked hazelnut are characteristic of the woody understory. Herbaceous cover is high but composed of a somewhat variable mix of upland and floodplain species. Many associated plants are tolerant of disturbance and may be found on fresh to moist upland soils (e.g. rough goldenrod, dwarf raspberry, red raspberry, tall white aster). Bryophyte development is usually reduced except in less actively flooded sites, where shaggy moss cover may be high. Environmental Setting:FP5 is mainly associated with fresh to moist, nutrient rich to very rich alluvium soils. Soil depth, texture, and coarse fragment content is somewhat variable, but moderately deep loams, with few coarse fragments and reduced humus accumulation, are typical. The majority of sites are flooded annually or biannually, but some stands occur on infrequently flooded terraces. 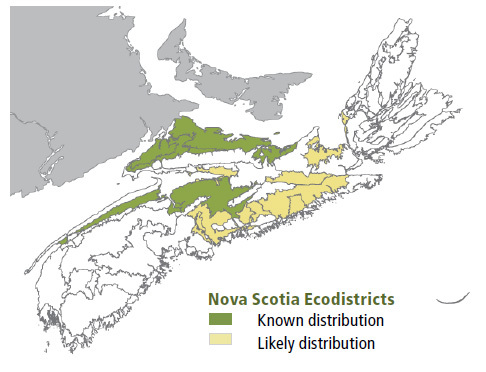 Most occurrences are in central and northern areas but some are in the Annapolis Valley ecodistrict. 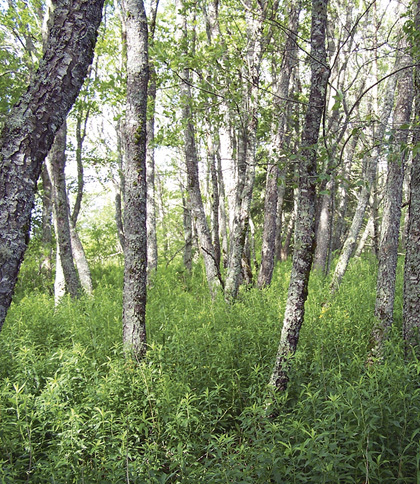 Black cherry has been found scattered on floodplains of southern Cape Breton, but because of the small percentage of black cherry on these site, they are not listed as FP5. Canadian occurrences are limited to Nova Scotia and parts of southern New Brunswick. Successional Dynamics:The Black cherry - Red maple / Rough goldenrod - Jack-in-the-pulpit forest is expressed at early to mid-successional stages. It may persist, as described, for long durations but most occurrences are expected to succeed to FP1 (Sugar maple – White ash / Ostrich fern – Wood goldenrod) or possibly FP2a (Red maple – Red oak / Bellwort – Nodding trillium variant Sugar maple). The majority of stands are found near agriculture or other disturbed areas. Disturbance agents include flooding, tree harvest, cottage development, domestic animal grazing, ice scour and disease (especially black knot fungus). 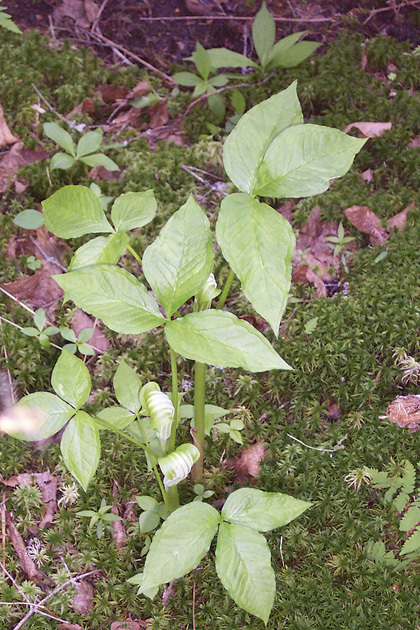 Ecological Features:The Black Cherry – Red Maple / Rough Goldenrod – Jack-in-the-pulpit forest is a relatively uncommon temperate pioneer ecosystem. It occurs as a small patch often in, or adjacent to, areas strongly shaped by past land-use activity. The closed canopy stand and its dense woody understory may provide important forage and nesting habitat for riparian wildlife. Beaked hazelnut, an important mast species, is especially common in this forest, but few rare plants are documented (e.g. early leaf brome grass, Philadelphia panic grass, black ash and Canada wood nettle). Larger intact tracts of this forest contribute to riparian connectivity, stream channel stability and aquatic health. Distinguishing Features: Black cherry is required to confirm this vegetation type found on floodplains and river terraces. Asters, goldenrods and sedges are extensive. Sites may not always be flooded annually. Sensitive fern and meadow rue is usually present.